wood, metal, paint, fake landscaping, fabric, lights, lcd screens, media players, speakers, transformers. 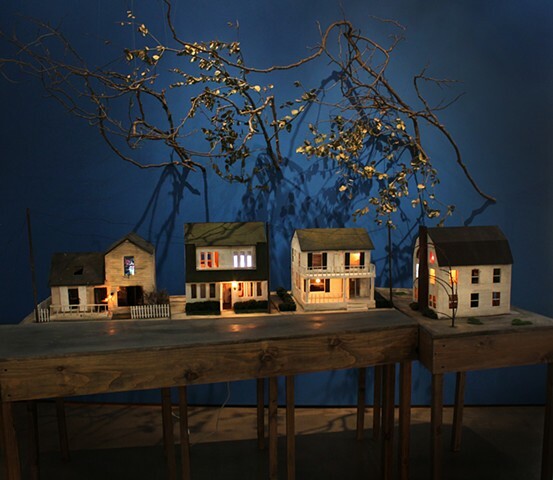 The installation is made up of 4 houses and one street. The houses reference houses in horror films, and contain videos from those films. They represent The Birds, Halloween, Nightmare on Elm Street, and the Amityville Horror. They also have sound from the video clips, such as screaming, birds, swarms of bees, and a discussion about the boogeyman.